The flavors of Roasted Parsnips & Carrots are great by themselves but add a dash of cardamom, and a drizzle of pure maple syrup and you now have a side dish that is a worthy companion to anything (and everything) else on the dinner plate. 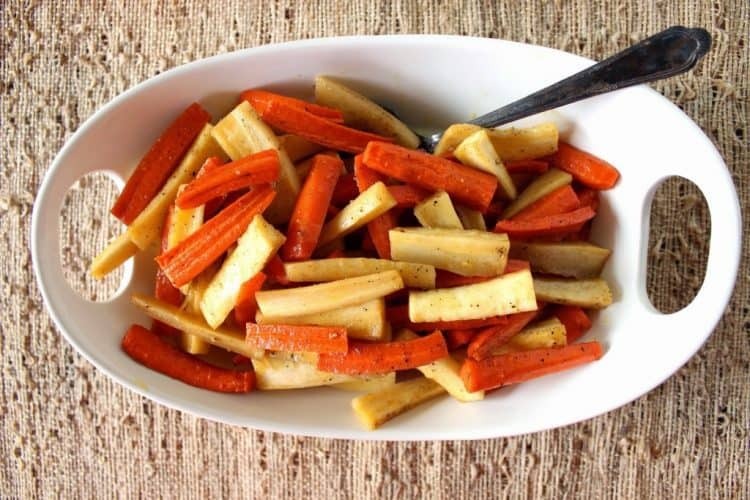 Roasted Parsnips & Carrots with Cardamom and Maple Syrup are a glorious mix of yellow parsnips and vibrant orange carrots which are oven roasted to a tender crisp, and then drizzled with pure maple syrup and sprinkled with spicy and sweet cardamom to finish. 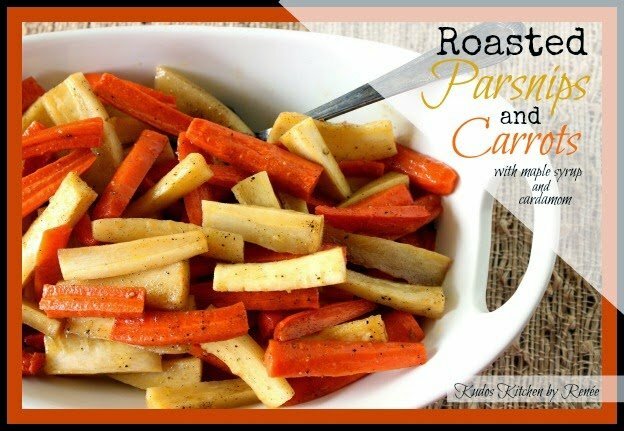 Roasted Parsnips & Carrots a perfect recipe for fall (or any time of the year) and one that Mother Nature herself would be proud to serve on her own #SundaySupper table! **Please Note – The printable recipe card with detailed instructions and complete ingredient measurements for making Roasted Parsnips & Carrots with Cardamom and Maple Syrup is available near the end of this post. Unprocessed foods. What does that term mean exactly? Well, in a nutshell, it means nothing that comes in a box, can or package that sits on the grocery store shelf for an extended period of time. Unprocessed means nothing has been packaged by manufacturers with all manner of shelf stabilizers, additives, colors, and/or fragrances added to the product. Figure it this way; if you’ve seen it on a TV commercial, odds are, it’s NOT unprocessed, and it’s NOT something you or your family should be eating in your diet on a regular basis. Peel the parsnips and carrots. Cut the peeled vegetables into 2″ – 2½” batons. 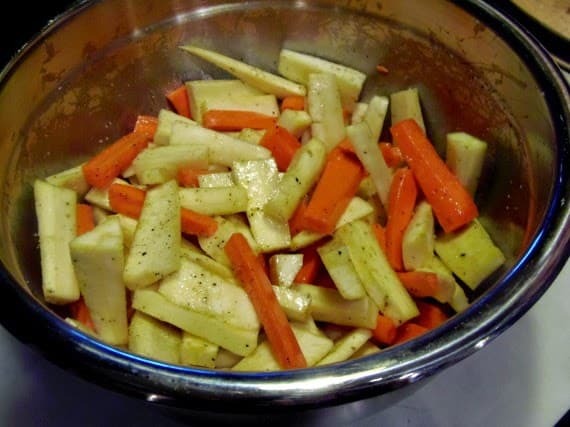 Place the parsnips and carrots in a large bowl and toss them with olive oil and butter. Layer the prepared vegetables onto a prepared baking sheet that has been sprayed with cooking spray, and drizzle them with pure maple syrup. Sprinkle the vegetables with the ground cardamom, salt, and pepper. Roast them in a 425-degree preheated oven for 30 minutes, flipping them halfway through the cooking process. Unprocessed foods are foods the way Mother Nature intended us to eat them. Pure, straight from the earth’s goodness with all their natural colors and flavors inherently provided by the sun, soil and rain. 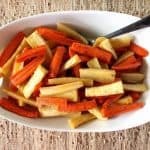 With this month’s #SundaySupper theme being unprocessed foods, I’ve decided to share with you my simply delicious recipe for Roasted Parsnips and Carrots with Cardamom and Maple Syrup. What can be more beautiful and unprocessed than that? Below is the printable recipe card for today’s Roasted Parsnips & Carrots with Cardamom & Pure Maple Syrup. The flavors of Roasted Parsnips & Carrots are great by themselves but add a dash of cardamom, and a drizzle of pure maple syrup and you now have a side dish that is a worthy companion for anything (and everything) else vying for attention on the dinner plate. Place the parsnips and carrots in a large bowl. In a medium bowl, whisk together the olive oil, butter, and maple syrup. Pour the wet ingredients over the parsnips and carrots and toss to coat. Sprinkle the parsnips with the salt, pepper, and ground cardamom. Roast in a preheated oven for 15 minutes. Remove the baking sheet from the oven, toss the vegetables, and return the vegetables to the oven to roast for an additional 15-20 minutes. I sincerely hope you’ve enjoyed today’s Kudos Kitchen recipe for Roasted Parsnips & Carrots with Cardamom and Maple Syrup as much as I’ve enjoyed bringing it to you! A big THANK YOU goes out to DB (aka Foodie Stuntman) of Crazy Foodie Stunts for all his hard work in hosting this week’s #SundaySupper theme of unprocessed foods. Black Bean and Corn Salsa by What Smells So Good? 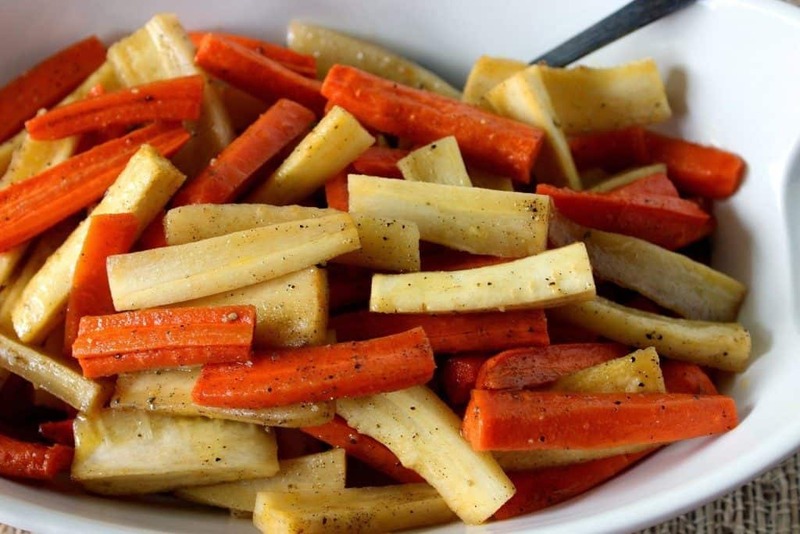 Should you have any questions regarding this recipe for Roasted Parsnips & Carrots with Carmadom and Maple Syrup, or anything else you’ve seen on my site, please don’t hesitate to contact me directly, or leave me a comment in the comment section below. It is always my distinct pleasure to get back to you with a reply just as soon as I possibly can! Thank you for the smile and your explanation of no TV commercials probably means a food is unprocessed. Also appreciate the explanation of how to roast extra delicious carrots and parsnips! I always seek out parsnips this time of year. I can't wait to cook them with your recipe. Oh my goodness – I am pinning this to make with my next roast! I think with the cardamom and maple syrup glaze this is going to be my new fall favourite! There's a reason why these ingredients pair so well together and you executed them beautifully. 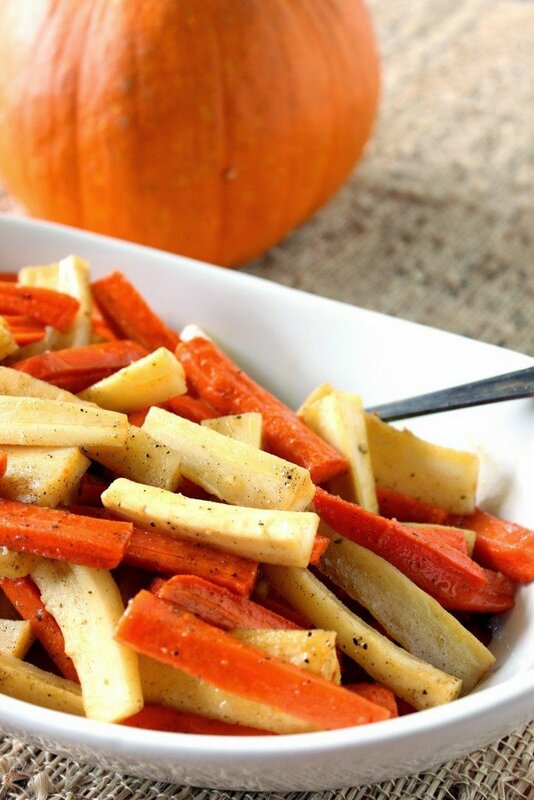 I adore roasted veggies…and this combination plus the maple syrup make for a perfect autumn side! P.S. Nearly spit my tea out when I saw Foodie Stuntman's comment….too funny! I love roasted veggies of any kind. But add cardamom and I'm in foodie heaven! Thanks for sharing with #SundaySupper. I bet if she had them this way my mom would LOVE parsnips! This is the perfect fall side dish. I love your addition of cardamom, I bet these veggies taste incredible! This is my favorite way to eat carrots (apart from crudité) love the cardamom addition 🙂 Hope you are having a fantastic Sunday! Yum yum yum!! My daughter and I both adore parsnips! This may be making an appearance on my Thanksgiving table!! I love carrots and parsnips together. I bet the cardamom works great in here! Roasting veggies is the best – especially root veggies. And cardamom is one of my favorite spices. Great recipe! Confession: I've never cooked with parsnips before! (I can't even say if I've tried them–gasp!) Will absolutely be buying parsnips at the market today–thanks for the inspiration, and cheers to this unprocessed recipe! 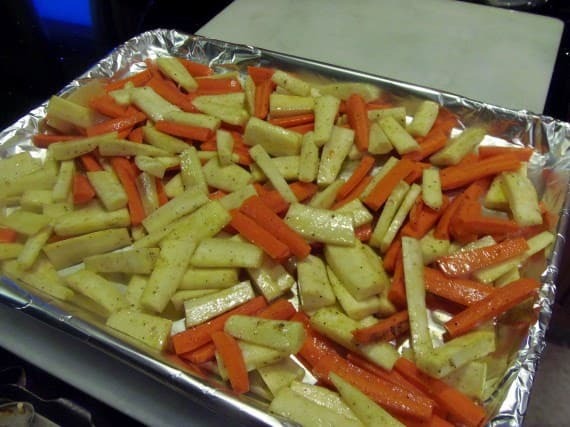 My only downside, was that the vegetables stuck so badly to the aluminum foil, that we were almost eating crumbed carrots and parsnips (think broken chips at the bottom of a chip bag). I’m not sure where I went wrong there, but otherwise, I thought it was an overall tasty way to eat something that I on’t normally like. Thank you so much for reaching out to me on this recipe and for your comment. I will take full responsibility for the sticking of your vegetables to the foil. I should have, but neglected to add, spray the baking sheet liberally with cooking spray. I don’t know how much that would have helped the sticking issue, but I would imagine it wouldn’t have been such an issue. So sorry about that. I’ve since added it to the recipe and post so thank you for bringing it to my attention. I believe it is the sugar in the pure maple syrup that was carmelizing and sticking the vegetables to the tray. On a side note, I’m glad you’ve branched out and tried the cardamom. Now that you have it, don’t neglect to use it in baked goods as well. It’s a nice compliment to all kinds of baked goods. That said, a little goes a long way, so add it sparingly.